Today we’ve been delighted to welcome members of the Health Archives and Records Group (HARG) to LHSA. HARG was established in the late 1980s and acts as a representative body for archivists and records managers working in the health sector in the UK and Ireland. For more information see their website. Members from across Scotland and England converged on Edinburgh University Main Library’s meeting room suite for an afternoon of productive discussion, which ranged from ways to reinvigorate HARG through the website/social media and the issues associated with digitisation, to possibilities for project funding and creating catalogues with built-in links to related material. 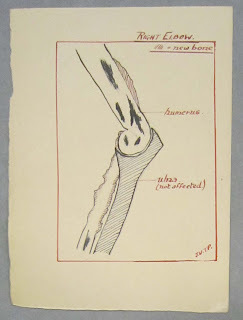 We also found out about the online catalogue for the Royal College of Physicians of Edinburgh (http://archives.rcpe.ac.uk/calmView/) – a great new resource for research in the history of medicine. Once the official business of the meeting was over, we offered those attending a tour. Starting off in the Centre for Research Collections reception area (to show off the fabulous reading room facilities), we moved on to the Viewing Room (where the Royal Infirmary of Edinburgh Royal Charter, dating from 1736, was on display) and the Conservation Studio to see some architectural plans of the Royal Edinburgh Hospital undergoing treatment. It was a fantastic opportunity to talk through shared issues relating to the long-term preservation of, and access to, health records and to strengthen professional contacts with those working in our sector: an afternoon well spent! Yesterday the staff of LHSA was privileged to visit Craig House, the neo-gothic mansion built to house private patients of the Royal Edinburgh Hospital, and opened in 1894. It was sold to Napier University in the 1990s and functions as one of their campuses although it has recently been sold to developers. Having worked closely with the plans, photographs, patient and administrative records of the Hospital, it was with great excitement that we headed to the site to be shown around by a member of the Napier University Press Office. Despite its change of use in the late twentieth and early twenty-first centuries, the building is remarkably similar to how it looked in the photos taken over 100 years ago: it has lost none of its atmosphere or grandeur (especially on a dreich Edinburgh afternoon!). The Grand Hall is immediately recognisable and remains an impressive room with high ceilings, chandeliers, two large fireplaces and polished floor, although the original furniture is long gone! We were led on a fascinating tour back through time into many of the wings, along corridors, up winding staircases into the staff quarters, and past beautifully-tiled walls, stained-glass doorways and intricately-carved door frames. Even some of the original radiators are still in existence! We continued our tour into the grounds to see the other buildings: Queen’s Craig, South Craig and Bevan from where we admired the views back towards the City. 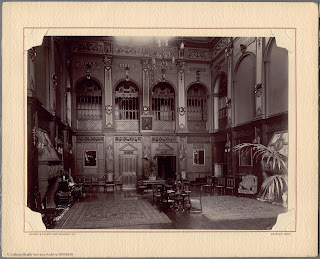 It wasn’t hard to imagine the Hospital as a peaceful retreat designed by the third physician superintendent of the Hospital, Thomas Clouston, to resemble a Victorian country house. Photographs were taken of Craig House, and the exterior of the other buildings, to capture them as they are today before redevelopment. These will be added to the Archive so that this phase of their story is not lost before the next phase begins. 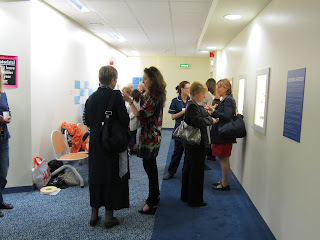 We’ll be adding some of the photos to our Flickr page in due course but for a preview, check our Facebook page at www.facebook.com/lhsa.edinburgh. 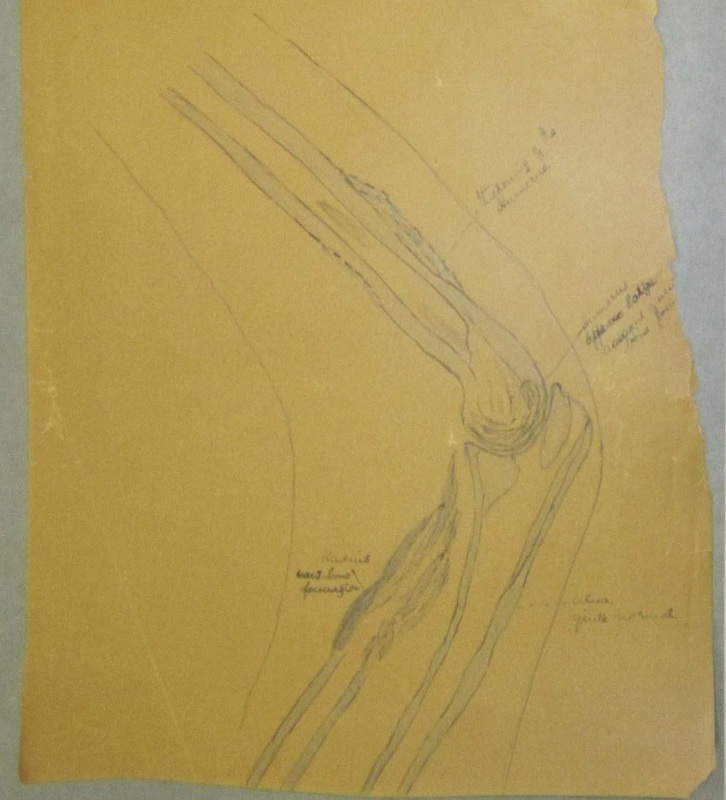 We reported last month on a drawing found amongst the Alexander Miles case notes and this week we feature some more drawings from this case note collection. 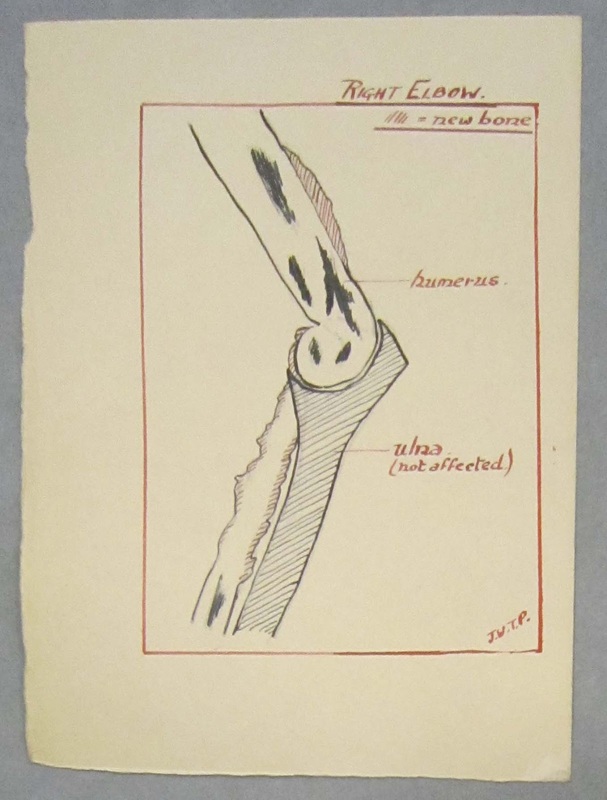 They are highly detailed drawings from 1919 showing the progress in treatment of a patient’s right elbow which contained tuberculosis (TB) in the joint. 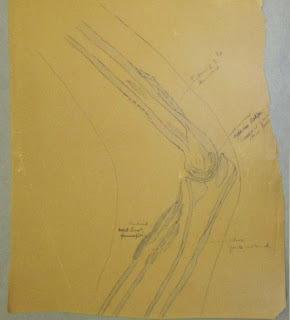 It is not known whether the drawings were used in teaching, but their discovery alongside the case notes would indicate that they were used solely for the purpose of treatment. TB is a highly contagious disease, usually affecting the lungs but which can attack other parts of the body. It is spread through the air by coughing, sneezing or spitting. It was very common in Edinburgh throughout the 19th and the first half of the 20th centuries, with the poor condition of tenements and overcrowding leading to its spread throughout the population. The health of those affected declined slowly over a period of months and years, if untreated, meaning that they were able to move around the community spreading the infection. Dr Robert Philip’s famous ‘Edinburgh Scheme’ resulted in a decline in deaths from TB from 1899 onwards by identifying those with the disease and preventing its spread. Before the discovery of antibiotics, sanatoriums, such as the Royal Victoria Hospital, were built where early onset TB patients could recuperate with plenty of sunshine and fresh air whilst being kept separate from the rest of the population. Colonies such as Southfield and Polton opened to provide recovering patients with work in an environment conducive to their health. A concentrated effort was deemed essential to eradicate the disease and in 1958, a mass x-ray screening of the population for the disease took place. As a result of improvements in treatment from the 1950s there has been a steep decline in TB cases although there are still around 400 cases in Scotland every year. 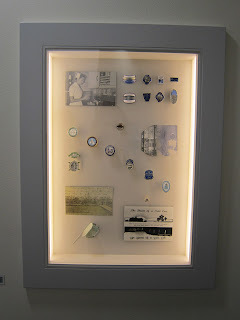 Last week’s blog touched on the long-term transfer of some of our historic nursing and hospital badges to the Royal Infirmary of Edinburgh as part of a new installation celebrating the role of unsung heroes in healthcare. 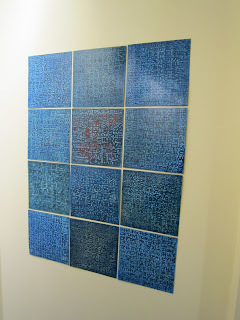 This saw a two-year project come to fruition so we thought it was worthy of another blog post and some more pictures! The installation is outside Outpatient Department 3 in the Royal Infirmary of Edinburgh and has three cases set into the wall displaying historic badges alongside contemporary artworks that were inspired by them and the oral history testimony collected from current and retired nurses. A panel produced by noted enamel artist Elizabeth Turrell and some smaller pieces with quotes from nurses are also on display. The installation was launched on 30 March with representatives from the project partners, nurses who had contributed their oral histories (some of whom were wearing their own badges!) and Royal Infirmary staff. It was a great opportunity to celebrate the achievements of the project with them. For more information please see the LHSA website, which has just been re-vamped to reflect our social media work better. We now have a brand new home page with a display of images to showcase various aspects of our work and collections, and a new social media page with direct access to our twitterfall and most recent blog posts. We hope that you’ll take a look!